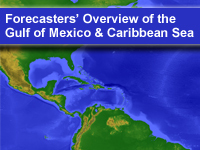 This module provides an introduction to the Gulf of Mexico and Caribbean Sea for weather forecasters. It focuses on major aspects of the geography, oceanography, and climatology. Geography covers major political boundaries, cities, ports, topographical features, rivers, and volcanic areas. Oceanography includes major bathymetric features, mean sea surface temperature and surface salinity, ocean currents, and tidal ranges. Climatology covers the seasonal climatology of jet streams and synoptic weather systems, extratropical cyclones in the Gulf of Mexico, and monthly and seasonal statistics of tropical cyclone activity. i really appreciate these tutorials ,they are very informative, and are full of nothing but education, and knowledge. This is good course overall. Well broken-down with good diagrams to put points across well. This looks magnificent! You've brought the Tropical Meteorology series to the western hemisphere in a big way. I especially appreciate the Oceanography/Climatology coverage. A similar approach to the West coast of Africa would be deeply appreciated.